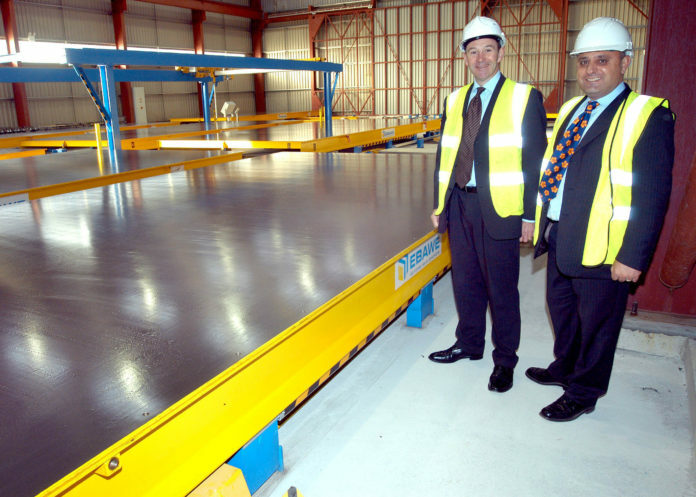 UK ‘FIRST.’ Ewan McClymont (left), head of grant services at Bishop Fleming, and David Moses, managing director of Cornish Concrete Products Ltd, pictured with the company’s market-leading new automated circulating carousel plant. A Cornish firm has achieved a “first” in the UK construction industry with a projected £2.65 million investment programme phased in over the next five years, involving new equipment and the prospect of 30 new jobs over the same period, funded by the South West RDA (SWRDA). As part of the biggest single investment in its 30-year history, Cornish Concrete Products Ltd (CCP), based at Bissoe near Truro, has installed the first phase of an automated circulating carousel plant that will eventually have curing and stacking capability. The project, also involving new systems and software to integrate the total operation, is designed to safeguard the firm’s existing 51 jobs and, subject to market conditions, create a further 30 positions by 2014. “It will give us a first-to-market advantage with the manufacture of precast double walling, which is growing in popularity but all of which is currently imported from Europe,” said managing director David Moses. “The investment will also enable us to develop two totally new products for new markets. It will reduce our carbon footprint and increase our proportion of secondary sourced materials, which is already industry leading, from 70% to 80%. Assisted by Bishop Fleming’s specialist Grants Service, the project has been made possible with the approval of an SFI (Selective Finance for Investment in England) grant from the RDA. “CCP is investing in new industry-leading products that should help the company maintain turnover in a challenging market”, said Ewan McClymont, Bishop Fleming’s head of grant services. “With the new carousel plant, they can respond to customer demand and create opportunities that would previously have been out of their reach”. Founded by brother and sister Hugh Harazi and Estelle Moses, CCP manufactures a wide range of structural and architectural products, and delivers bespoke projects in all areas of the UK. Products include flooring, staircases, cladding panels, insulated sandwich panels, lift shafts, culverts and retaining walls. Customers range from local builders to large construction companies and multinational PLCs. All customers are UK-based and sectors include commercial construction, education, health, marine, entertainment, sport and retail. Recent civil and bespoke projects include Truro College, Tremough Campus, Boscastle Bridge, White City Shopping Complex in London and the O2 Arena in London.